Three political parties are seeking their first seat on Peterborough City Council after putting up candidates for May’s local elections. Two pro-Brexit parties and a party founded by veterans are among nine different groups fielding candidates on Thursday, May 2. It promises to be an exciting election night with voters in 20 city wards going to the polls with a third of the council’s 60 seats up for grabs. Not only are the Conservatives seeking to hold onto their wafer thin majority of one seat, but the elections are being held the day after a Recall Petition into MP for Peterborough Fiona Onasanya closes. If 10 per cent of her constituents sign the petition then the independent MP will lose her seat and a by-election will be triggered. 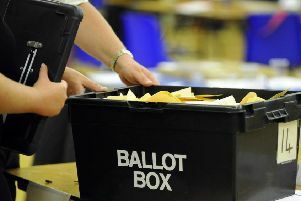 The result is expected to be announced before polls close for the local elections. With Brexit uncertainty and anger continuing to divide the country, and the council seeking to overcome its worst ever financial challenge due to huge government cuts, it promises to be an eventful time in local politics. Two parties seeking to take advantage of the uncertainty are the Social Democratic Party, which is fielding a candidate in Eye, Thorney & Newborough, and Our Nation, which is fielding a candidate in Fletton & Woodston. The Veterans’ and People’s Party - a party founded by veterans which “exists to build and safeguard a free and open society” - is also putting up a candidate in Dogsthorpe. Currently, 31 of the seats on the council are held by the Conservatives, compared to 14 for the Labour group, seven for the Liberal Democrats, three for Werrington First and one each for the Green Party, UKIP and Liberal Party. Two seats are currently unfilled. The Tories are defending 10 of their seats, compared to six for Labour and two for the Lib Dems, meaning a very strong evening for the opposition could deliver enough seats to allow them to form a coalition and take control of the council. Peterborough parliamentary candidates John Whitby (UKIP, Fletton & Stanground) and Joseph Wells (Green, Gunthorpe) are both standing. Defeat for Mr Whitby, on top of a failure for his party to win elsewhere, would mean no UKIP representation on the council. UKIP’s former Peterborough parliamentary candidate Mary Herdman is standing for the Social Democratic Party at the local elections. Five of the 20 seats up for grabs are currently held by members of the Conservative cabinet, with only three seeking re-election.
. Steve Allen - cabinet member for recreation (Eye, Thorney and Newborough). Neither Howard Fuller (Hargate & Hempsted) nor Sam Smith (Ravensthorpe) are standing again, while former cabinet member Lucia Serluca (Fletton and Woodston) is also not seeking re-election. Former leader of the Labour group Mohammed Jamil is another who will have to be re-elected to keep his seat in Central ward, as will deputy mayoress Judy Fox (Werrington First) who currently represents Werrington. Dave King, Conservative member for Hampton Vale, was deselected by his party. Among those seeking a comeback are former council leader and ex-Mayor of Peterborough John Peach, the Conservative candidate for Park ward. The Greens are targeting a second ever seat on the council after earning their first win last year through Julie Howell in Orton Waterville. Former parliamentary candidate Nicola Day is standing in the ward this time around. The Greens join the Conservatives, Labour and the Lib Dems in fielding candidates in every seat. The Lib Dems are putting up Kevin Tighe, former chief executive of culture and leisure trust Vivacity, in Hargate & Hempsted. Only one independent is standing this time around. The Recall Petition for Ms Onasanya, which lasts six weeks, was automatically triggered by her three month prison sentence for perverting the course of justice. The MP was found unanimously guilty of lying about who was driving her Nissan Micra when it was caught speeding in Thorney in July 2017. She was expelled by Labour the day after her conviction. Should the Recall Petition prove successful a by-election is likely to be held around the start of June and possibly a week or two after European Parliament elections depending on the latest Brexit developments.